Alex’s Lemonade Stand Foundation Infant and Childhood Primary Brain and Central Nervous System Tumors Diagnosed in the United States in 2007-2011. Ostrom QT, de Blank PM, Kruchko C, Petersen CM, Liao P, Finlay JL, Stearns DS, Wolff JE, Wolinsky Y, Letterio JJ, Barnholtz-Sloan JS,. 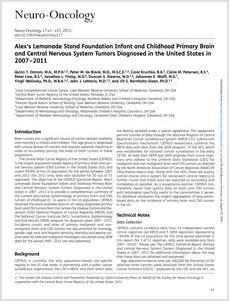 The CBTRUS Statistical Report: Alex’s Lemonade Stand Foundation Infant and Childhood Primary Brain and Central Nervous System Tumors Diagnosed in the United States in 2007–2011 comprehensively describes the current population-based incidence of primary malignant and non-malignant brain and CNS tumors in children ages 0–14 years, collected and reported by central cancer registries covering approximately 99.8% of the United States population (for 2011 only, data were available for 50 out of 51 registries). Overall, brain and CNS tumors are the most common solid tumor, the most common cancer, and the most common cause of cancer death in infants and children 0–14 years. This report aims to serve as a useful resource for researchers, clinicians, patients, and families. Posted in Jill Barnholtz-Sloan, Publications and tagged Brain Neoplasms, Central Nervous System Neoplasms, Glioma, Humans, Neoplasms, Germ Cell and Embryonal, Registries, Survival Analysis, United States. 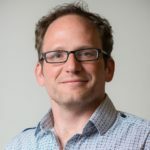 William S. Bush, Ph.D., is a human geneticist and bioinformatician, and Assistant Professor within the Cleveland Institute for Computational Biology and the Department of Population and Quantitative Health Sciences at Case Western Reserve University.